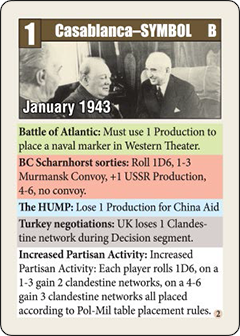 Churchill is a three player game of Coop-etiion where the players must cooperate to win World War II, while at the same time achieving a superior post war position over your allies. 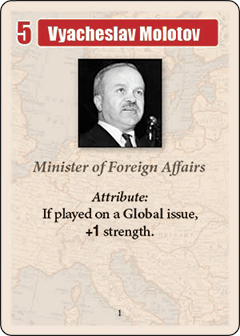 If the players collectively fail to defeat the Axis the Allies lose, but if the Axis are defeated, there is a victor of the peace that follows. 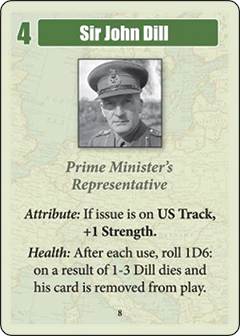 This will be a full game of Churchill using the Campaign Scenario. I will keep track of the board state using text. 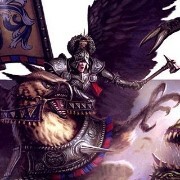 Updates will be about once a day. If you need more time to decide if you'd like to debate a card, let me know. 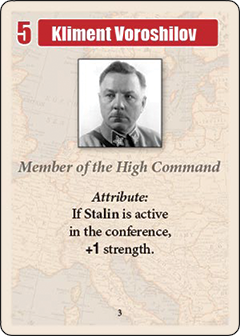 Increased Partisan Activity: Each player rolls 1D6, on a 1-3 gain 2 clandestine networks, on a 4-6 gain 3 clandestine networks all placed according to Pol-Mil table placement rules. 3 clandestine networks are received. I'm curious how you're going to handle VP tracking - in the games I've played we've tracked it as what the final scores would be if the game ended right then (so including UK points for empty colonies, points for not reaching the Philippines, points for no A-Bomb, etc.). I know some people only track the clandestine network and political marker points and some only do conference victories and the Normandy/Central Italy points. It's probably a good idea to establish that from the start so people don't get confused near the endgame. Mmm, good point. I was just going to do VPs gained during the game, and then total everything else up at the end, but your way would probably be best. I'll update that shortly. 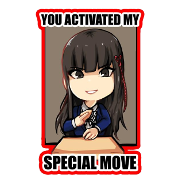 I mentioned it in the Wargame thread, but my internet connection is gonna be spotty in the next week and I'd rather not have the game stall if I can't get online. 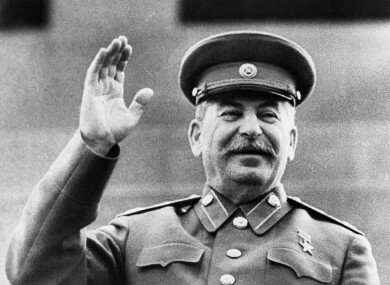 Great friend to the west Josef Stalin wants to announce his joy to the participating countries in the fight against fascism. 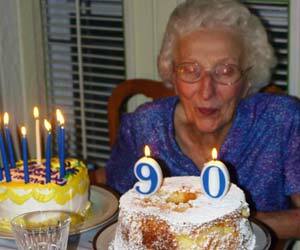 Let us crush this Nazi menace, yes? Alright, well, I'll volunteer for that then. Hopefully there will be another game after this that you can get in on! Churchill and Stalin are tied for the Agenda segment. 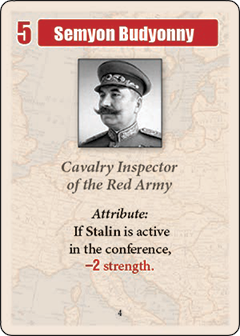 Starting with Stalin, a player may use their leader to break the tie, else Roosevelt will choose the winner. 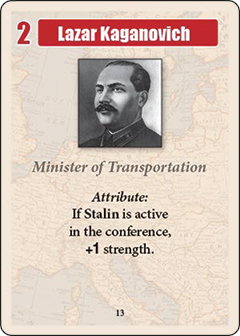 Per PM, Stalin elects not to break the tie. Using a leader to break a tie does not require a discard, it simply makes them inactive for the rest of the conference. I know, still not playing him. Your comrade and good friend Stalin can make those promises. And keep them. I also did not know this. Keeping that in my pocket for later. The second part is the important part. I suppose I'll find out if you're trustworthy right away. 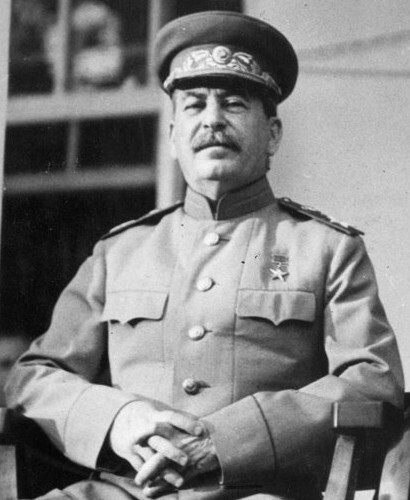 Break tie in favor of Stalin. 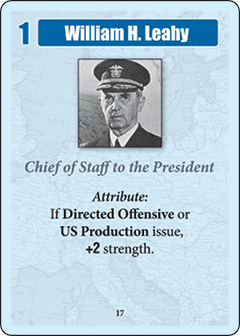 Roosevelt breaks the tie in Stalin's favor. 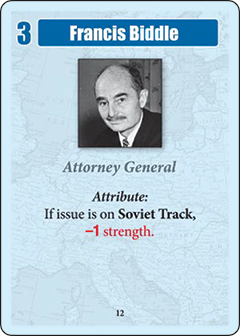 Stalin, please post an issue you would like to place on the second space of your track. 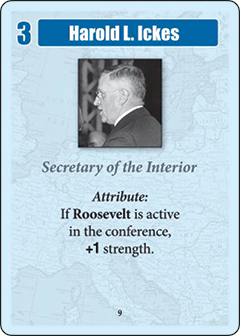 Then, starting with Roosevelt, each player should post two issues to be on the table this conference. 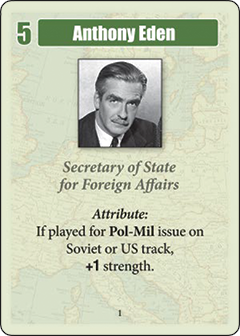 Anthony Eden on Pol-Mil issue. Will you also play a card on your regular turn or pass? 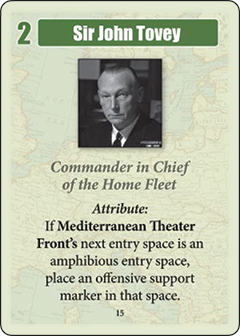 Play William Leahy on US Directed Offensive for 1+2=3 strength. You used John Dill during the Agenda segment. Wow I'm an idiot. Sir John Tovey then.